Popularly known as Baidyanath Dham, Deoghar is a famous place of worship for the Hindu community. 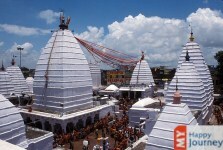 Located in the state of Jharkhand, temple of Baba Baidyanath is present in the city of Deoghar. This city is also regarded as a house of different gods and goddesses as a large number of temples adorn this place. Located perfectly with a backdrop of beautiful surroundings, this town remains as one of the calmest cities of the state. The holy ambiance of the city provides immense peace to the body and mind. Baidyanath temple located in the city is famous all over the country and is associated with Lord Shiva. Large numbers of devotees from different parts of the country visit this temple to offer their prayers to the god. Different attractions offered by this city are Shivganga pond, Devasangha Math and Ramakrishna Mission Vidyapith, to name a few. Wonderful decorations during the festive celebrations illuminate the city which looks even more beautiful. The exquisite hills known as Nandan Pahar lie in the vicinity and are a famous picnic spot. Being well connected with the help of road and air service, visitors can easily travel to this holy city to seek Lord Shiva’s blessings. Weather of this region remains comfortable throughout the year; therefore a trip can be planned in any month to enjoy a visit to this city. The scenic beauty and pleasant weather of the region make it a destination of choice for travelers who are looking forward to enjoy an unforgettable trip.